Email Us | Shop Now! The Terminus Tnode is a communication control terminal with a compact, rugged enclosure that encapsulates everything needed for short range IoT capabilities. The two orderable frequency types allow for system deployment in different networks with little change in design or investment. Powered by the Synapse RF engine, the Tnode contains all circuitry required to operate in 2.4Ghz or 915Mhz frequency ranges. 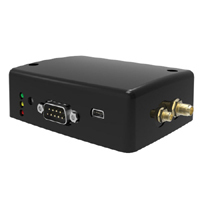 It can receive power from a 12v wall wart or a 5v mini USB connection, contains a serial RS-232 for programming and debugging, and has discrete and analog inputs for monitoring. With such versatility, the Tnode becomes an easy answer for mesh network needs.